Christmas of 87, I received a walkman, Bon Jovi's "Slippery When Wet", and this album on cassette… about 20 years later I began working in the music business. COINCIDENCE??? Well, people should know at least one thing by now - when it comes to pop, few do it better than the Swedes, and this album is a great example. This is almost the prototypical metal "boy band" - very pretty boys, very catchy songs, and very inoffensive overall. Still, there are many far worse things that were born out of the 80's "glam" era, like Trixter, Slaughter, Winger, et al. Give me this record any day over those "glam ballad" bands. At least these guys knew how to have some fun. So very 80s rock revival. My copy has embossed sleeve and poster included. Let's set the record straight. This is not a good album by any means. It doesn't work as metal. It's too soft to be hard rock yet still at times too hard to be soft rock. It's quite a mishmash but this is what guilty pleasure are made of. As cringeworthy as ballads like "Carrie" are, there are the equally as cheesy yet entertaining rockers like the title track, "Rock The Night", and "Cherokee". Still, it's easy to make fun of this band, especially with a singer named Joey Tempest but I'm sure there's a lot of you who keep this record hidden in a basement where no one else could find it. Even in its worst moments, there are tracks here that are worth at least one listen. Then again, it'll be hard to get the synthesized keyboard riff of the title track out of your head after you hear it. I like this combination of hard rock riffs and keyboards very much. Ok, their voices are sometimes too high but it is really not that bad, I think. At least it is better than all the vocoders and all the autotune stuff of today. "Rock The Night" and "Ninja" are very enjoyable. Of course, the eponym track also rocks since more than 30 years. Cheesy at times, but satisfying overall. 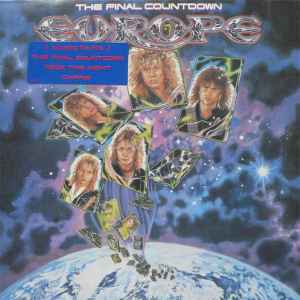 However, as a remaster, only 3 live tracks coming from the same songs of "The Final Countdown" leaves me rather disappointed. Instead of this, some bonus tracks could have been welcoming without any problem. Otherwise, the sound quality is correct. Bought this album sealed back in 2011 at a flea market for $10. The first LP i ever bought in the 80´s. As a Swede this album was big back then. Maybe a little bit nerdy today. Unfortunately i lost the old pressing, but recently bought this "blue vinyl" pressing. And this is by far Europes best album. To be honest the other albums they made is not to good. This pressing looks cool in blue, it sounds fantastic to. Great bass and clean sound! Buy it. 5/5. Final statement: heavy metal with euro Italo disco synth. Swedish mix - influence from 2 sides.